The School District of Philadelphia (SDP) has approximately 350 schools scattered throughout the City of Philadelphia. 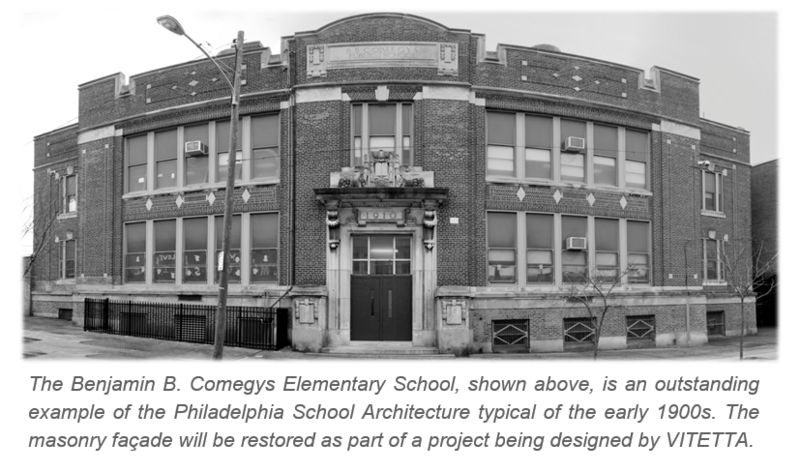 Many of these schools are examples of exquisite public school architecture, designed by noteworthy architects – such as Irwin T. Catharine and Frank H. Furness – and dating from the early 1900s. The facades of many of the SDP’s older schools include finely detailed masonry work, including brick, carved limestone, granite, and ornamental terra cotta. VITETTA began providing services to the SDP in 2002 under an Indefinite Delivery/Indefinite Quantity contract (IDIQ). The services provided in the early portion of these IDIQ contracts primarily focused on structural evaluations of building envelopes; including façade failures and masonry restoration. 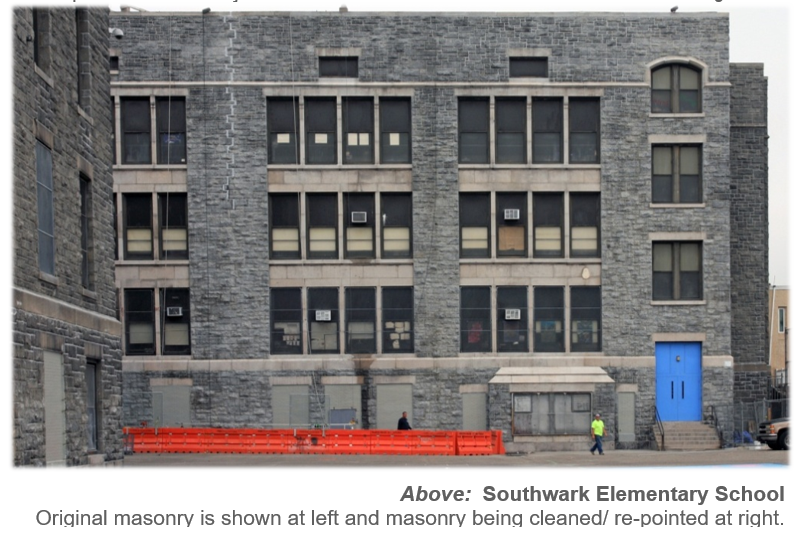 During the past 16 months, VITETTA has begun helping the SDP save its schools from masonry deterioration and failing roof systems, one building at a time. Our more recent projects include complete services for design, bidding, and construction phases. VITETTA works directly with the SDP’s Office of Capital Programs, which includes in-house architects and engineers assigned as project managers. VITETTA’s expertise in all types of construction – coupled with in-house, nationally-recognized, historic masonry preservation staff – has proved a valuable resource to the SDP. Together, we’ve corrected façade failures and preserved several of the SDP’s beautiful school buildings so they may provide many more years of server in the future. The typical duration of design services of these projects is in the 4-month range; however, VITETTA has been able to respond more quickly to projects with needs requiring a more aggressive timeframe in order to expedite critical repairs. For instance, the Anna B. Day Elementary School included rebuilding a failing masonry parapet and VITETTA completed the design/bidding documents in one week. This responsiveness allowed the SDP to bid the project and award the construction for the 2015 summer season, while the school was closed. Work was bid on budget and completed prior to the start of school in September 2015. The following page outlines VITETTA’s excellent track record of delivering quality services to the SDP within their budget and schedule.